It's #plasticfreejuly and we're about halfway through the challenge. One of the things I've been struggling with is coming up with ways to go backpacking that don't involve plastic. I turned to my friends Dustin & Noami to give me their suggestions. While it's sometimes difficult to go completely zero waste when you might already own food packaged in plastic, this article suggests tips for reducing the amount of new items you have to purchase. 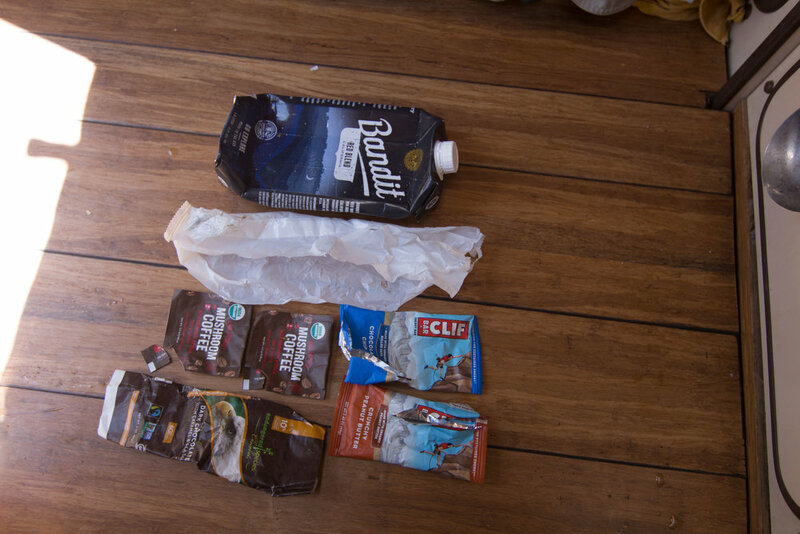 Find out what they purchased, how they prepared their meals to avoid backcountry meals packaged in plastic, and how much waste they generated from their trip. Dustin and I just wrapped up three glorious days during a zero-waste backpacking trip in Yosemite National Park. This required a lot of planning and prepping—making lists and reevaluating our gear. It also meant obtaining a level of awareness about our waste consumption that we’ve never had to consider before. Although we could have just gone backpacking the way we were used to doing, we wanted to see if it was possible to do a zero-waste trip while still enjoying the experience. We’re aware of our impact and practice Leave No Trace principles. But after traveling throughout southeast Asia for the past six months, we’ve become more conscious about our waste. We’ve learned the importance of planning ahead, recognizing that our waste begins with the choices we make as consumers. This is especially true with plastic, which ends up in our landfills and eventually in our oceans. Plastic will outlive us all. We chose Yosemite National Park because it holds a special place in our hearts. Our first trip to Yosemite was four years ago and it was the spark that ignited our nomadic lives. We chose to hike Ten Lakes Basin, a 13.8 mile out-and-back trail with 2,200-feet of elevation gain. It offers stunning vistas with sweeping panoramas of the Grand Canyon of Yosemite and the Tuolumne River Valley. We spent two nights in the wilderness, so we prepared for a total of three days. On previous backpacking trips, we ate freeze-dried camping meals, but these are typically packaged in single-use plastic and are expensive. Plus they’re not as nutritious as home-cooked meals. We shopped for our dry goods in bulk and visited a local market for perishables. This not only reduced our packaging waste, but also saved us some money. Overall, it was the least expensive backpacking trip we’ve ever done. Have you heard of beeswax wraps? We recently learned about them from a friend and now we use them for everything. Made from beeswax and hemp cloth, they’re reusable and extend the life of your food (ideal for backpacking). We brought our beeswax wraps to the deli and asked them to put cheese directly into them. This sparked up some interesting conversations at the counter. Beeswax wraps aren’t recommended for raw meat, so we used a Tupperware container to purchase our bacon. We nearly made a grave mistake. We forgot to buy wine in town, an essential for sitting around the campfire. Fortunately, the general store in Yosemite carries Bandit Wine. It comes in a 1L Tetra Pak carton which is made from paper and is 100% recyclable. Even though it’s still waste, it’s a better alternative than the box wine or bottle we would normally bring with us. It’s lightweight and made for backpacking. Half the fun was preparing our meals. It was also half the work, but this meant that we wouldn’t have to cook at camp, leaving more time to play. Our meals were vegetarian (except of course the bacon). I’m always nervous about meat spoiling, especially in the heat of summer. The beeswax wraps were a lot of fun to work with. We used them to wrap our sandwiches, cooked bacon, and our vegetable sticks and cheese. We twisted them, wrapped them, rolled them, and at dinnertime, we made them into bowls. Our fruit and nuts remained in the bulk bags just as we purchased them, ready for the trail. Precooking our meals eliminated 90% of the waste that we would normally carry in the backcountry, including compost waste that we would otherwise have to pack out. This helped to minimize our gear as we didn’t need cooking utensils. We carried only our sporks and a small mess kit for coffee. Speaking of gear, we used only solar-powered and rechargeable lights, eliminating disposable batteries—which contribute to environmental issues if not disposed of properly. If you’ve ever backpacked in Yosemite, you'll know it’s bear country, so properly storing your food is required. In order to safe guard our wilderness friends from our food, we stored all our food, trash, and toiletries in bear canisters. Dustin and I always travel with one, but this time we needed a second. We ended up renting another one from the backcountry office for $5. You can also purchase Ziploc baggies at 10 cents each for packing out toilet paper. But since we’re minimizing our waste, we decided to use an old dry bag, or ‘dirt bag’ as we like to call it, to pack out our trash. The next part I left to the Tetris master. First, he packed all our food into the bear canisters, and each of us carried our own rations. Next, he strategically packed our gear, balancing out the weight proportionately. My pack is 45L and I can comfortably carry between 20-25 pounds. Dustin’s is 55L and he tries to keep it under 30 pounds. This was the lightest our packs have ever been. The type of toiletries we use outdoors is often overlooked, but they produce waste that can be detrimental to the environment. Many contain micro plastics and harsh chemicals that can harm wildlife and pollute waterways. We ended up bringing an all-natural non-nano zinc oxide sunscreen with no fragrance. For insect repellent, we used lemongrass essential oil (which worked for about an hour) and our backup was an all-natural insect repellent spray. Something we’ve always done on the trail is collect any trash we encounter along the way. This is where our ‘dirt bag’ really comes in handy. On this particular trail however, we didn’t find much trash, so packing out was a breeze. On this trip, we used water purification tablets for our drinking water. A better option would be a SteriPEN or a lightweight water filtration system like LifeStraw. Next time, we’ll opt for a wine flask, which is more durable and flexible than a box. As an alternative to packaged protein bars, we’ll make our own. One thing we didn’t have that would have been handy is a couple of food thermos or a set of lightweight stainless steel food canisters. This is an upgrade we’ll be making before our next backpacking trip. We learned from this experience to always bring more wine! On a serious note, this was the most enjoyable and organized backpacking trip we’ve ever done. We were more intentional with our planning. It required more work to prepare, but as a result, we had lighter packs, less waste to pack out and more time relaxing at camp. Have you done a zero-waste backpacking trip? We’d love to hear from you. Photos courtesy of Noami & Dustin Grevemberg.